Shamrock tie bar features gold construction that is enhanced with an embossed herringbone motif. This shamrock tie bar has been hallmarked 9K gold by the Irish Assay Office at Dublin Castle in Ireland. 9ct is .375 pure gold and was at one time the Irish standard for export to the United States. These 9ct gold shamrock tie bar measures 2" wide x 3/16" tall and features a 5/8" wide x 1/2" tall symbol. 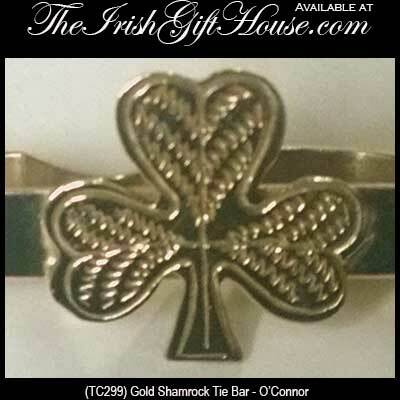 The Irish tie clip was made in Ireland by O'Connor Jewelry and it is gift boxed with a shamrock history card, complements of The Irish Gift House. Connemara marble is inlaid in each leaf of this gold shamrock tie tack that includes a fob and chain. Gold shamrock tie bar will make a subtle but definitive statement about your Irish heritage.